The better for crafting, my dear. 1. Use a combination of open and closed storage so your craft room will be as pretty as the projects that come out of it. Take a full tour of this craft room on The Craft Patch here. 2. 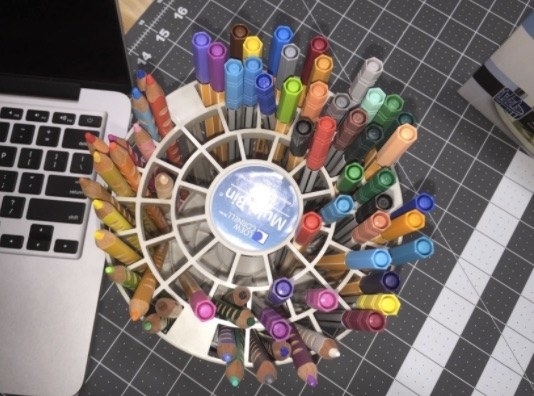 File away coloring and drawing pencils, (as many as 72! ), in this zip-able pouch. Now you can better tell blush from coral. Get it from Amazon for $10.39. / Also available in black. 3. Whip up a pocket hoop to hang your oft-used quilting tools near your work surface. Learn more about this pocket hoop on A Crafty Fox here. 4. Maintain the sanctity of kraft paper and holiday goods in this wrapping-paper bag that'll store horizontally or vertically. 5. 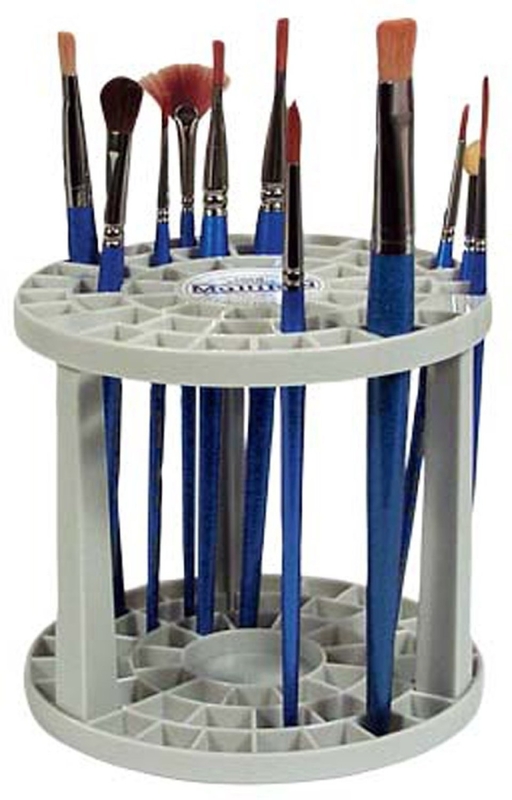 Get a better look at bristles and color choices by storing painting and drawing utensils upright in this brush stand. Get it from Amazon for $9.60. 6. Or, just use spare pretty containers to house all your utensils out in the open. See the full home tour on The Everygirl here. 7. Gather loose, tiny things like spools of thread, beads, and buttons in this lightweight, mountable craft cabinet. Get it from Amazon for $34.22+. / Also available in red. 8. Shelve fabric like books so you can see what you're grabbing. See more details on I'm Feelin' Crafty here. 9. Put four rolls of washi tape in rotation on your workspace tabletop with this polar-bear tape dispenser. 10. Rig up a handy pegboard by framing it and hanging hooks fit for your favorite crafting tools. Throw in some plants there, too! Read the full tutorial on A Beautiful Mess here. 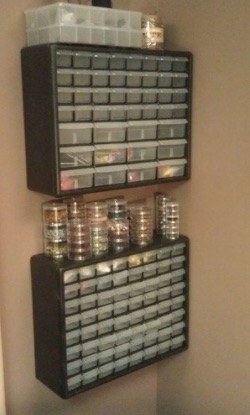 Get a pegboard wall organizer with a 36-piece set for hooks from The Home Depot for $30.70. 11. 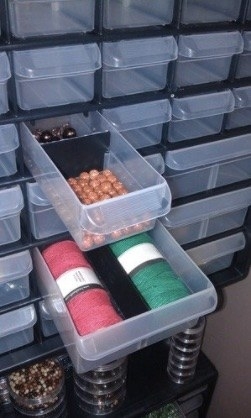 Or, use a pegboard to build a custom drawer organizer labeled for all your bits and tiny tools. Read this full tutorial here and a tutorial for a similar drill-bit storage tray here from Sawdust Girl. 12. Spin to find the perfect scrapbooking edge with this scissor carousel. Get it from Amazon for $30.50. 13. Tidy up your sewing corner with a pair of thread bobbin organizers that'll hold 28 sewing machine bobbins each. Each! Get a set of two from Amazon for $7.49. 14. Stash similar, oft-used supplies in clear jars so you can easily access them when you get the crafting itch. Zhuzh them up with a glass paint tutorial form Crafting Fingers here. Get a similar 50.75 oz. glass jar from Amazon for $5.95. 15. Organize ribbon scraps by winding them up on wooden spools. See how on The Crafted Life here. Get a pack of 50 wooden spools from Oriental Trading for $5.99. 16. Corral all your small-scale storage containers onto a rolling cart with raised edges so you won't lose any precious storage jars or bowls. See all the details on The Crafting Chicks here. Get a similar mesh rolling cart from Amazon for $27.87. 17. Stash stuff that you're using in your current project in this handy tote so you'll have easy access if you need a change of crafting scenery. Get it from Amazon for $11.99. / Available in nine colors. 18. Transform a Goodwill find into a multitasking shelf -- with ribbon storage! -- with a coat of paint and a dowel rod. Read the full tutorial on C.R.A.F.T. here. 19. Prevent stains, wrinkles, folds, and untimely death for your scrapbooking papers with this sturdy storage bin. Get it from Amazon for $7.19. 20. Line a recess with easy plywood shelving to organize your bigger, prettier supplies. See the full tutorial on Paper & Stitch here. 21. File away small-scale stuff like stencils and markers in this colorful organizer that you can wheel around as you please. Get it from Amazon for $29.99+. / Available in seven sizes, four colors. 22. Designate big bins for general categories of things that won't file away neatly into drawers. Read the full tutorial from DIY Candy here. 23. Store all your project necessities in this fancy knitting-needle case. Get it from Wood & Spool on Etsy for $73. 24. And pack up all your crafting supplies in an all-in-one rolling bag to take to work, on vacation, wherever! Get it from Amazon for $89.07.